Achieving success in today's college courses requires you to develop not only effective learning skills and study habits for use in the on-campus classroom but also the skills necessary for success when your courses use online technologies such as real-time chats, online discussion boards, and email. Internet-based - Courses are delivered through the use of Internet-connected computers, course websites, and digital communication tools. Course syllabi, content, activities, and assessments are accessed completely online. Flexible - Course content is accessible at your convenience. There are no specific "classroom" meeting times. You will complete weekly activities and assessments according to designated due dates, but based around your schedule. Interactive - You will use email, chat, discussion boards, and other online tools to communicate with your instructor and classmates. Rigorous - Online learning is as rigorous as traditional learning in a course taught face-to-face. Good study habits and basic technical skills are essential to your success in college and serve as the foundation of online learning. Have basic technology skills, including: basic computer navigation skills; word processing skills; online communication skills, and Internet navigation skills. Take the Technical Skills Self-Assessment to determine if you have the basic technology skills needed to complete online courses successfully. Feedback and resources will be provided at the end of the assessment. Enroll in Online Student Readiness (COMPUB-798), a self-directed four (4) hour course that introduces students to skills, technologies, and best practices for being successful in online learning. Students may register for the course through INFOnline. Registration is the process of signing up for classes. Students may register for courses by visiting their campus Welcome Center or by using INFOnline to register for classes online. 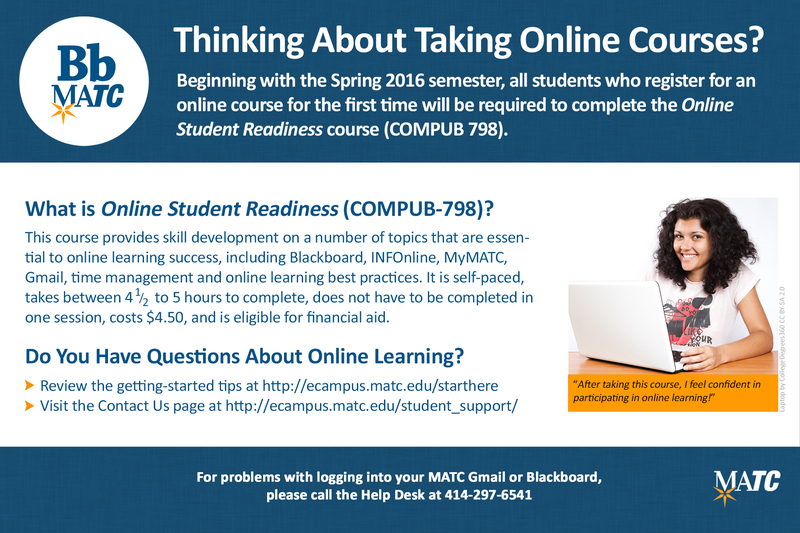 Beginning with the Spring 2016 semester, all students who register for an online course for the first time will be required to complete COMPUB-798, Online Student Readiness. This self-paced course provides skill development on a number of topics that are essential to online learning success. The course takes between 4 ½ to 5 hours to complete, does not have to be completed in one session, costs $4.50, and is eligible for financial aid. Please see INFOnline for fall and spring course availability. After you register for classes, please review the Start Here & Login Help pages. Where Do I Purchase Books and Software? Students should refer to their course syllabi and ask their instructors what specific software they will need for their courses. However, please see the Software and Plugins page for free or discounted software downloads. Books for your online courses can be purchased at MATC's Milwaukee campus Bookstore or at the Online MATC Bookstore. If you intend to purchase textbooks through Financial Aid, you must purchase your books in-person at a campus bookstore. When purchasing your books at a campus bookstore, please be sure to bring your course schedule and financial aid information, printed from INFOnline with you. How Do I Prepare My Computer for Online Learning?